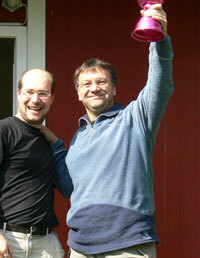 2nd Simultan Champion 2007: Bruno Staub! On 1st April FIDO Switzerland invited to Allschwil for the second simultan cup. The participants were divided into two groups and had to play at five tables: 3 games of Double-5 and 2 games of Double-12 twice. The permanent change of mode and being continously forced to make a move, challenged all competitors. The native players used their expeirence from the first championship and made the first ranks, while the rest stayed behind. That this might be according to their nationality is only a bad rumour. The winner was presented by the local press a couple of days later. Since hosting the world champion Marina Despotovic the media of the area are desperately looking for more of these sport news.